Cold weather did little to chill the enthusiasm of Montebello residents who turned out last weekend to take part in a mile-and-a-half walk to spread awareness about the “Go Red For Women” movement to fight heart disease. 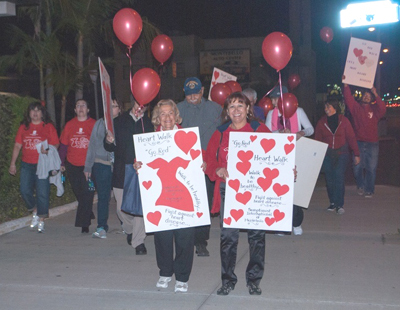 Dressed in red and carrying signs and balloons, participants walked from city hall to the Montebello Park Senior Center where they received information about ways to keep their heart healthy. Their route to the park took them along a busy street, prompting drivers to honk their horns in support of the walkers. Soroptimist International of Montebello, a service organization devoted to women and children, has organized the annual event for the past five years. Club President Cheryll Goto told EGP that while the event doesn’t raise a lot of money for the American Heart Association, their hope is that it raises awareness. “Every year there’s somebody new out there [who’s been diagnosed with a heart problem],” Goto said. “We’re walking to bring awareness of the heart … hopefully we could help some people,” she said. Soroptimist member Betty Peralta told EGP that most people who participate know somebody who has had a heart problem, however, Narine Evangelisci said she does not personally know anyone affected by the disease, but felt it was important to make the community more aware of the health issue. At the senior center, participants had their blood pressure checked, learned about the benefits of exercising and other ways to stay healthy, and were given pamphlets explaining how to identify a heart attack. Club member Christina Alatorre said that the information and screenings offered after the walk were very important. “Maybe they don’t go to the doctor that often, but [at least] they had their blood pressure read here,” she said. Montebello City Administrator Francesca Schuyler told EGP she attended the community event to support the cause and the organization. “The event is special because this is really a community organization that cares about the community, especially the woman in the community,” said Schuyler. According to the American Heart Association, heart disease is the number one killer among women, killing approximately one woman every minute. “Woman don’t realize it [but] we’re under so much stress,” said Goto. The organization hopes that next year more people will participate, but for now, they hope those who attended this year will continue to take care of their hearts.